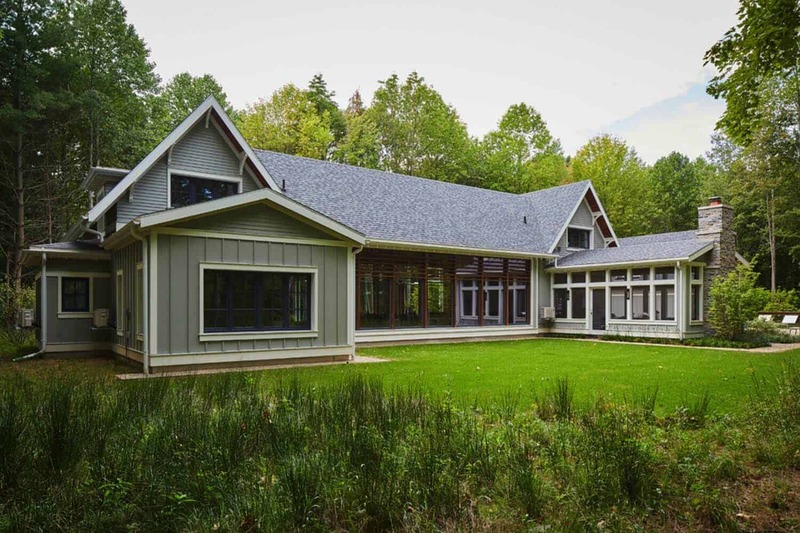 This fascinating net-zero energy vacation cottage was designed by award-winning architectural studio Morgante Wilson Architects, located in Harbert, Michigan. 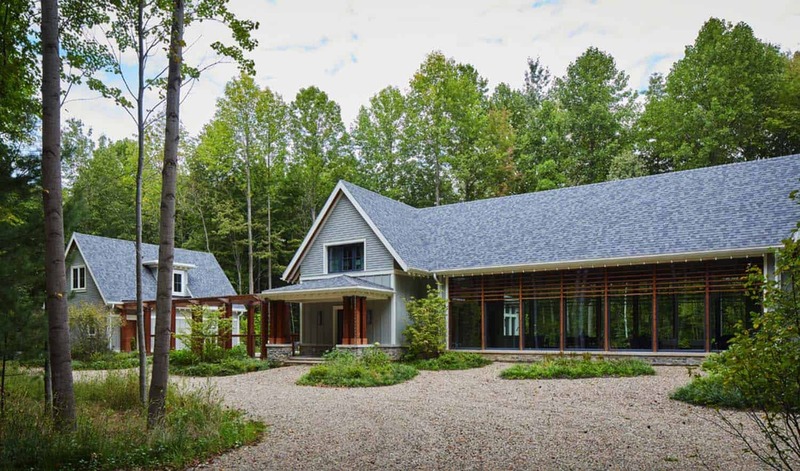 The architects designed this passive house with maintenance free hardie panel siding. 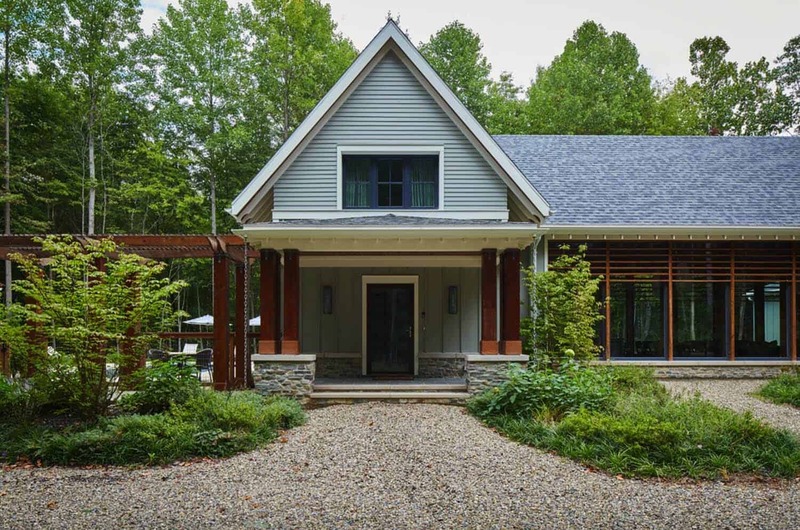 Upon entry in this dwelling, you will notice a beautiful interior layout that seems to effortlessly flow from one space to the next. 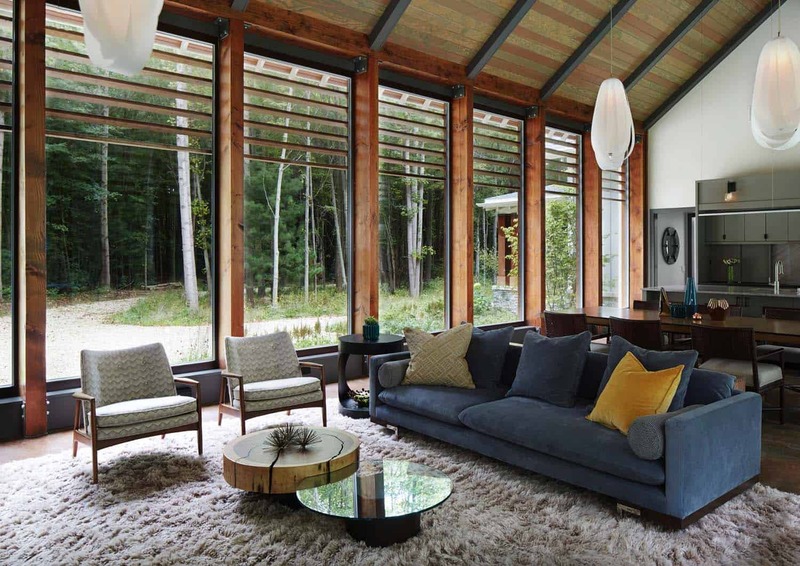 Soaring ceilings and tall windows helps to capture the forested surroundings while helping to bathe the interiors with light. 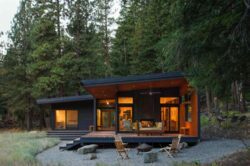 What We Love: This net-zero energy vacation cottage features an open and spacious floorplan layout. 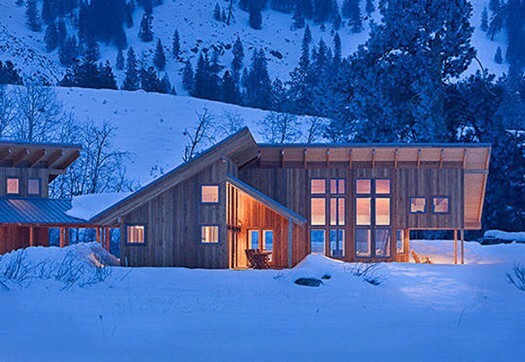 The interiors are illuminated with natural light thanks to expansive windows. 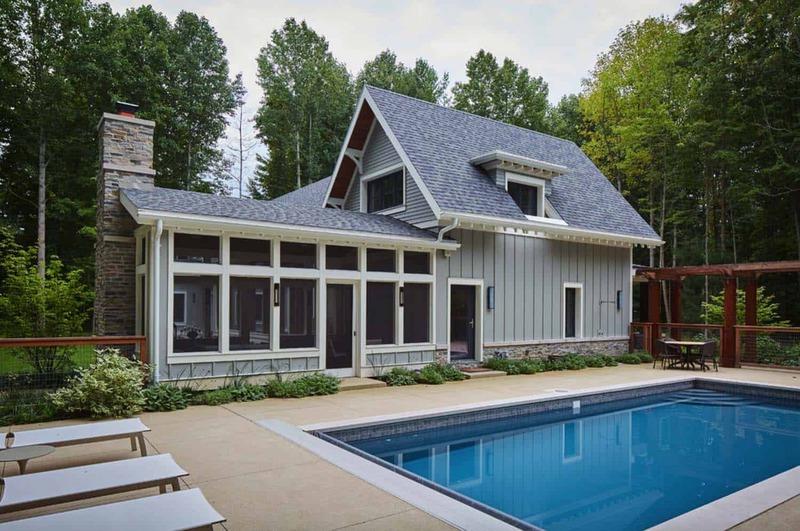 The windows also helps to capture the natural beauty that surrounds this fabulous home, creating a seamless indoor-outdoor connection. 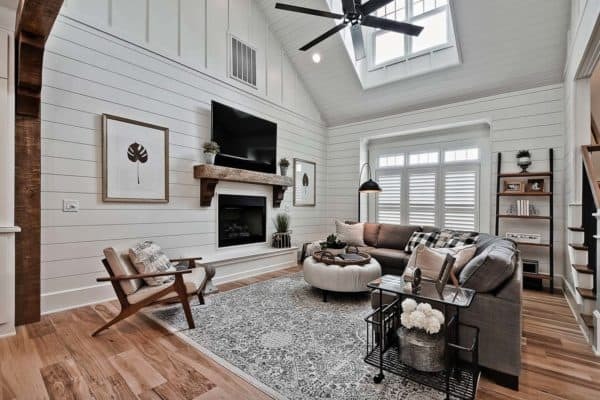 Overall a beautiful and inviting design… Readers, what do you think of this home, are there any details you would like to have seen designed differently? Let us know in the Comments! 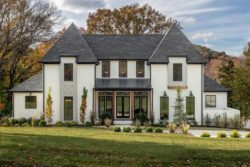 Note: Have a look at a couple of other amazing home tours that we have featured here on One Kindesign from the portfolio of Morgante Wilson Architects: Shingle style home in Illinois features interiors with understated elegance and Sophisticated Yet Casual Lake House Retreat in Wisconsin. 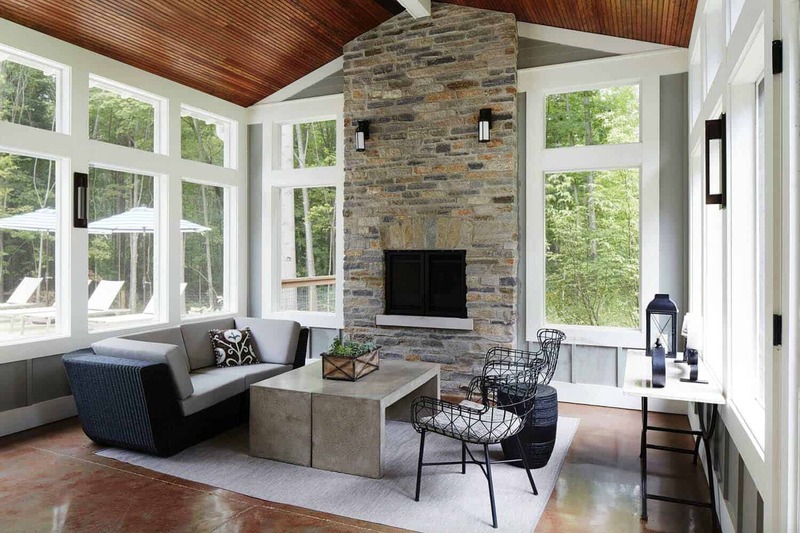 Above: The living room features a custom designed fireplace with a built-in bookcase surround. 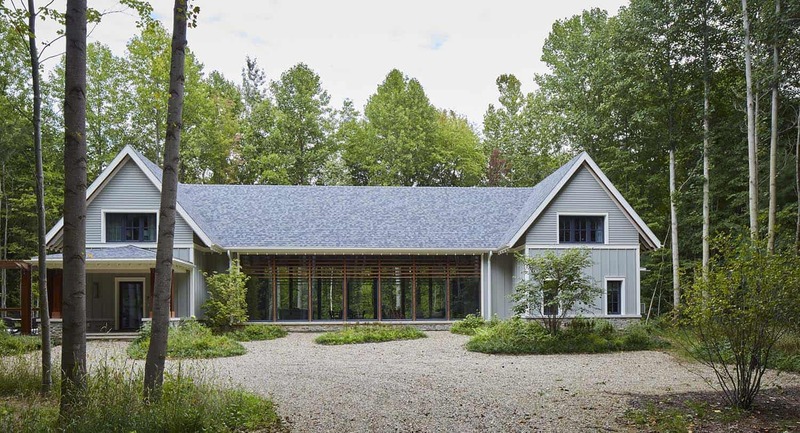 The cathedral ceiling adds volume and draws in the light from outside. 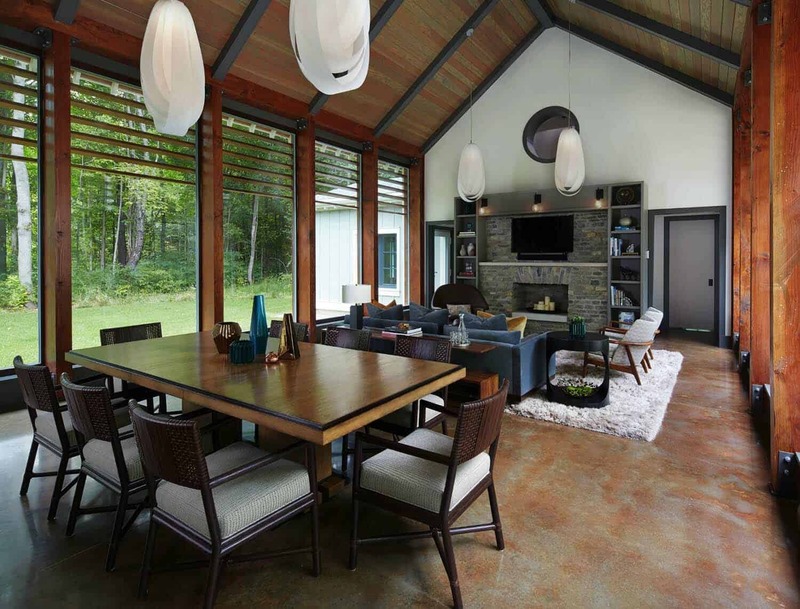 Above: In the open plan living area, 3-Form pendant lights are suspended from the ceiling to visually separate the spaces. The dining table is from Henredon, accented by dining chairs sourced from Baker. 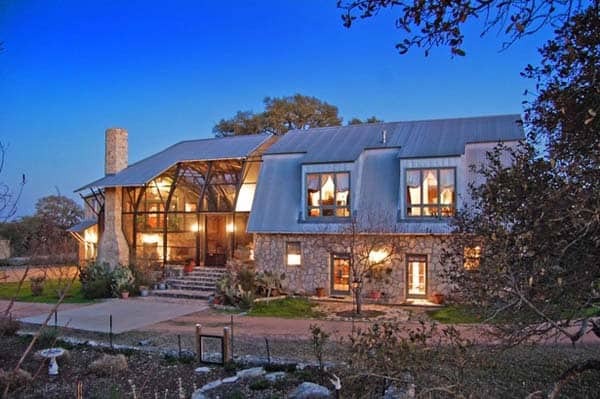 Above: The cathedral ceilings are clad in pine with metal beams. 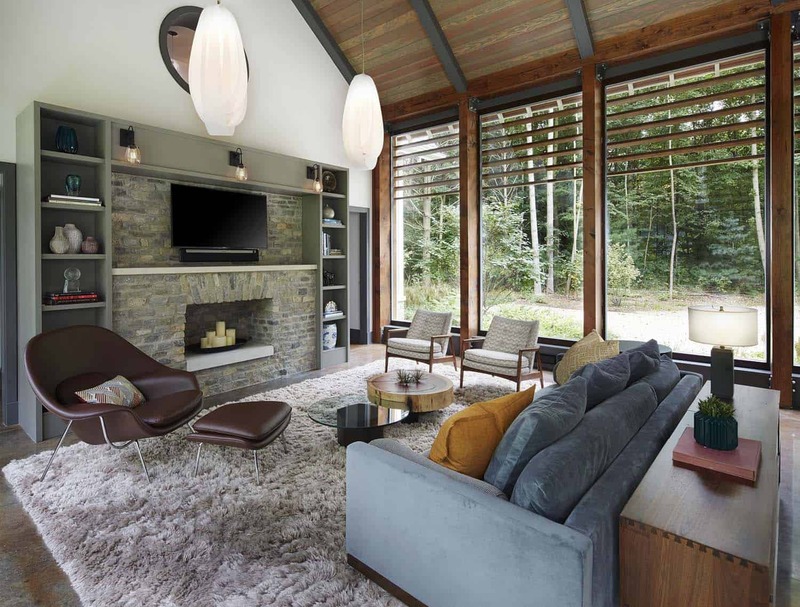 The modern sofa allows for maximum comfort on top of the shag rug, sourced from Nathan Anthony. 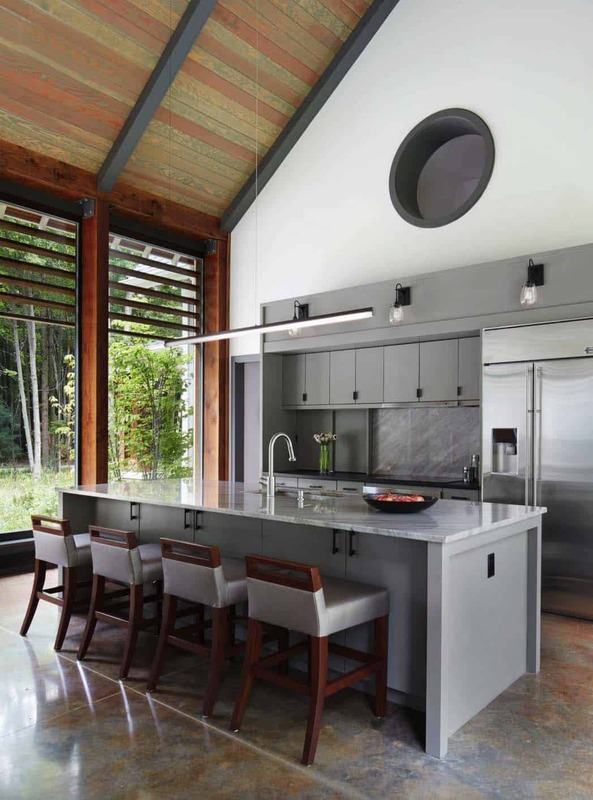 Above: A quartzite was used on the kitchen island countertop. Storage was maximized in this space thanks to cabinets on either side of the island. The island chairs were sourced from Nathan Anthony and covered in Holly Hunt fabric. 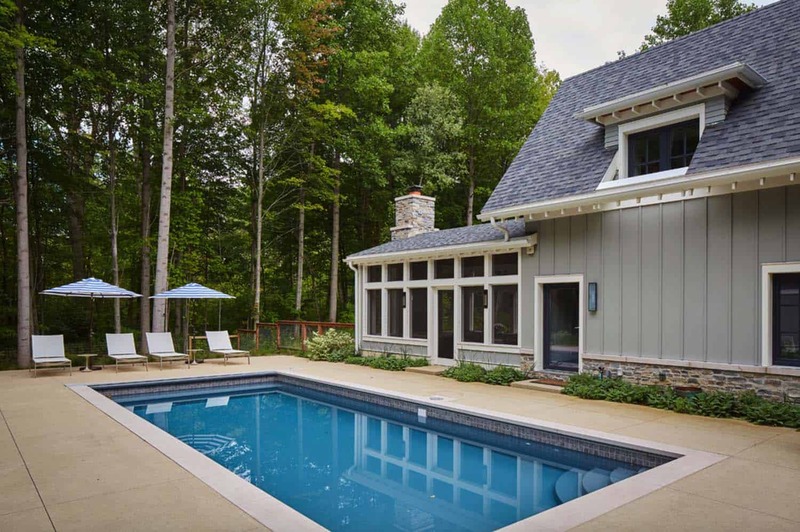 Above: This screened-in porch features plenty of character thanks to a v-groove ceiling and floor-to-ceiling stone clad fireplace. The raised firebox provides a better view of the fire. 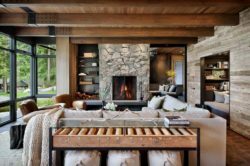 Dual concrete coffee tables are accented by a woven sofa, offering a relaxing place to sit and unwind. 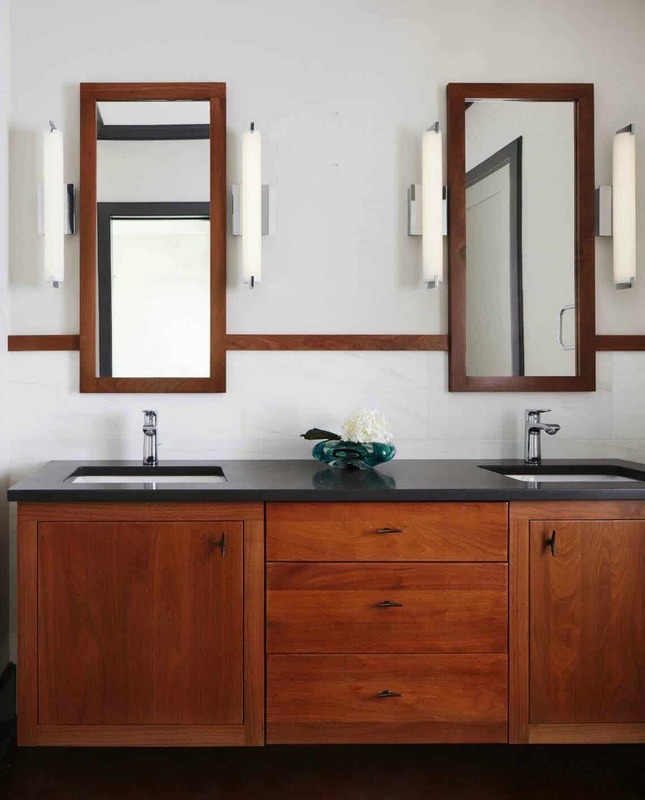 The wall sconces were sourced from Hubbardton Forge and Feiss. Above: A modern upholstered bed is paired with nightstands from Room & Board. On the wall, custom built-in bookcases provides plenty of display space. The trim is painted in Kendall Charcoal HC-166 | Benjamin Moore. Above: The bathroom vanity was custom designed out of walnut, complimented by a Caesarstone quartz countertop in the color Raven—4120. 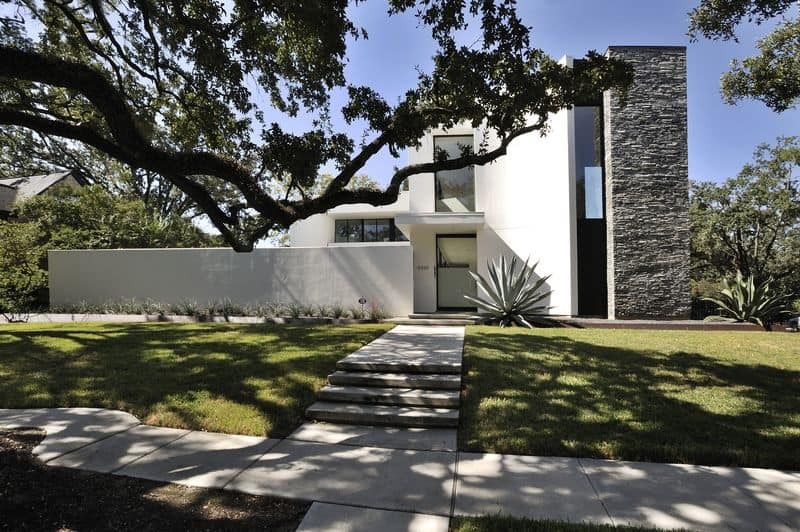 The wall sconces are from Lightology. 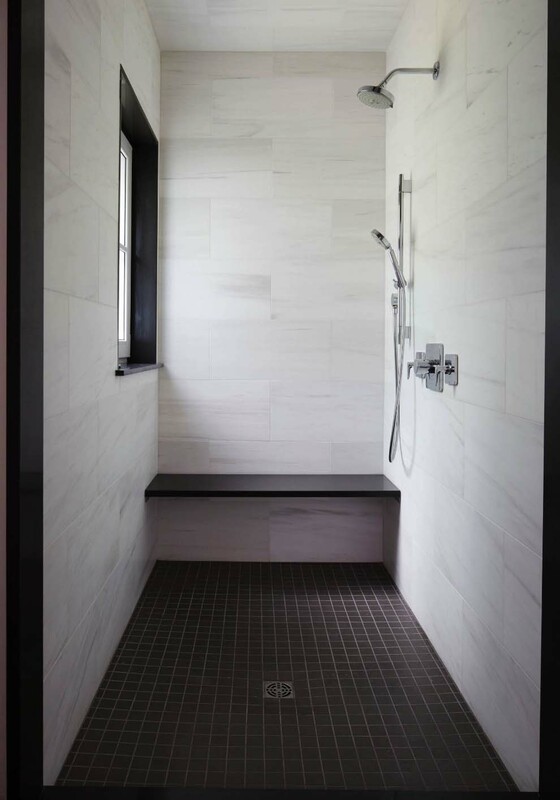 Above: To create a modern aesthetic in the bathroom shower, the wall tiles are from Stonesource, while the plumbing fixtures are from Hansgrohe. 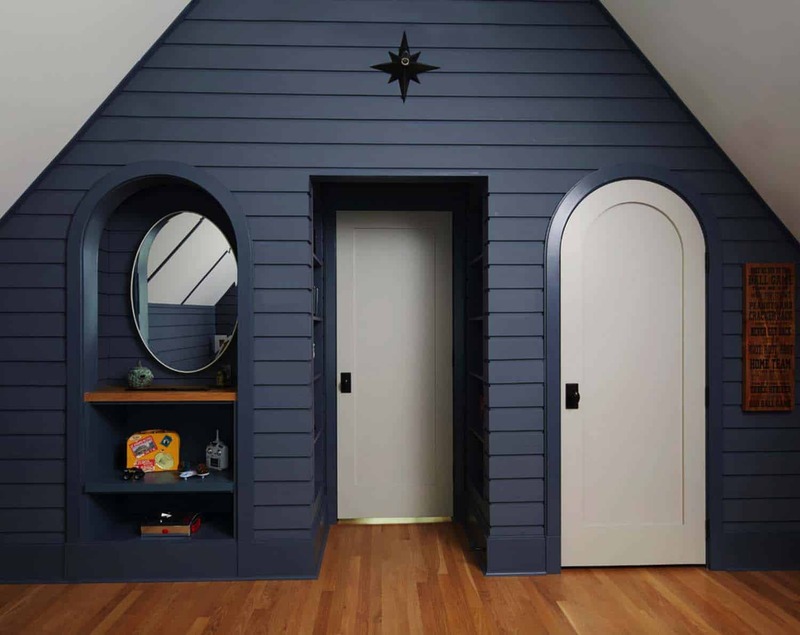 Above: In the kid’s bedroom, the shiplap walls were painted in Britannia Blue 1623 | Benjamin Moore. Above the door, a wall sconce sourced from Visual Comfort adds a touch of whimsy to this space. 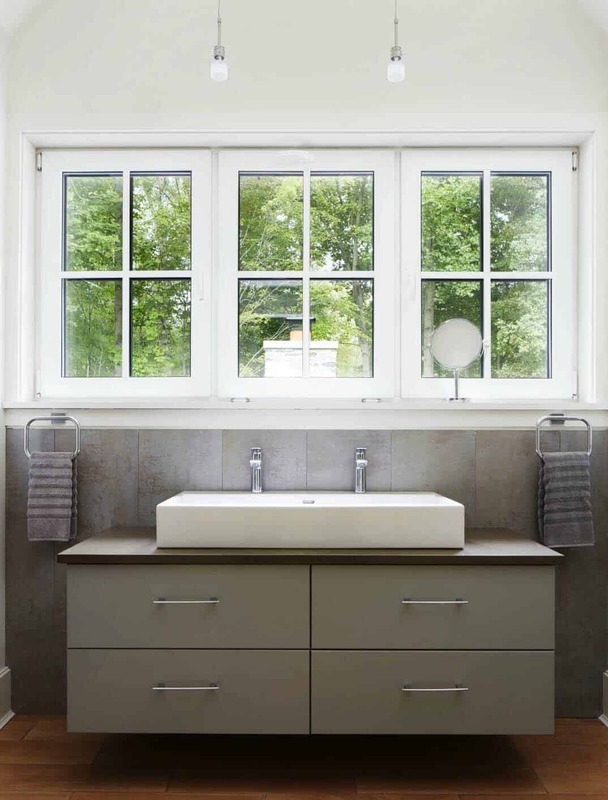 Above: The bathroom features Porcelanosa wall tiles and Caesarstone Lagos countertops on the vanity.